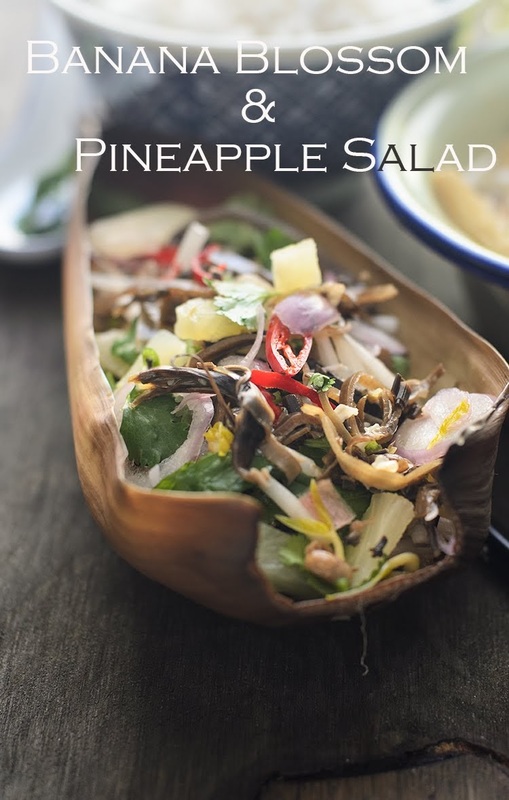 Delicious tropical Banana blossom and Pineapple salad. Its still summer in Perth, even though we 'are' technically should be in autumn comes March. We are into our second week of March, yet the mercury is cruising within low to mid 30's Celcius. Even though I would grumble about the weather a lot, but I am happy that I managed to whip up some old (revisited) salad like Asian herb Rice salad/ Nasi Ulam and Raw fish salad/ Yee Sang. I am also happy that finally, after many years, I found betel leaves / daun kadok and we get to savour our favourite Thai leaf wrap Salad/ Miang Kham. Have you seen banana blossom or try eating banana flower before? or perhaps you might come across one or two purple heart shape like /strange looking 'vegetable' in your fresh grocer. That is banana blossom/ banana flower . Please note that I am not an affiliate to this website. I am sharing the link as it has good information on banana blossom. I had my fair share of eating banana blossom. My parents had mango trees, guava trees, soursop plant, pandanus plant, Vietnamese mint, ginger torch plant and many more... and as well as banana trees around our house. My mom may have cooked banana blossom (once or twice) in coconut milk with turmeric, lemongrass, pounded bird's eye chilli and some prawns. But the one I remember most, was the simplest and most enjoyable meal, when she just halved the banana blossom, boil with some salt and serve with Malaysian Chilli dip / sambal belacan and deep fried fish, served with steam rice. That for me, is a complete meal. 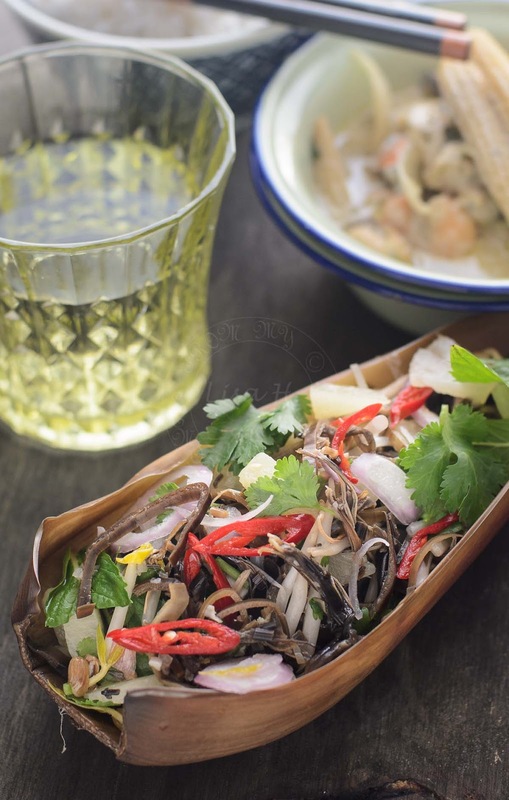 But today, I am sharing with you, my take on 'Thai' Banana Blossom and Pineapple salad. Its easy to make, and its tasty too. All my life, I had been eating cooked banana blossom, so when any recipe call for 'uncooked' banana blossom, I was a little bit sceptical. As far as I know, banana blossom is sappy and have a slight bitter bite to it. In the midst of preparing this Banana Blossom and Pineapple salad, I tried tasting the uncooked thinly sliced banana blossom, it was a NO NO for me. Perhaps its an acquired taste to eat banana blossom raw! What I did was, I gave the thinly sliced banana blossoms a quick blanched. That took care of the sappiness and bitter after taste. but it still retain some crunchiness. Banana blossom is flavourless, by adding sweet pineapple, fresh beansprout, chillies and fresh herbs really makes this Banana Blossom and Pineapple salad, one bowl of delicious and exotic salad, to add to your salad 'bucket' list. 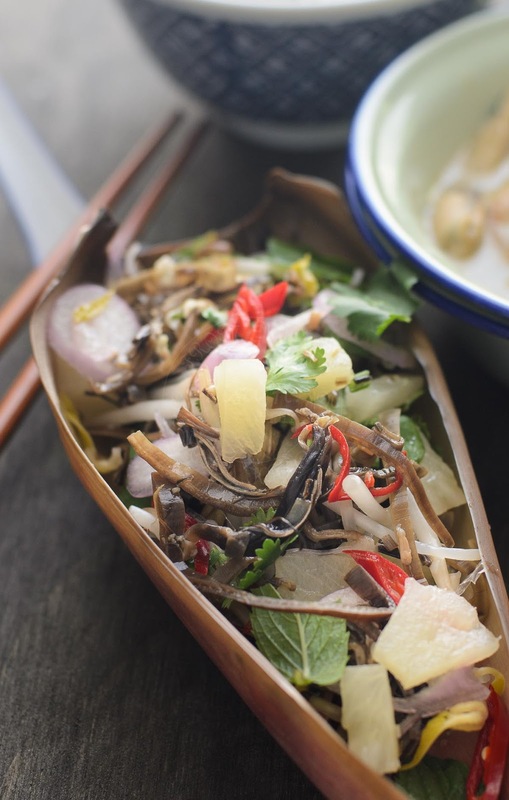 A tasty tropical salad of Banana Blossom and sweet Pineapple chunks. Thinly slice and soak in 2 tablespoon vinegar and 1 tablespoon salt with 1 litre of water for 5 minutes. Mix all the ingredients in a mason jar. Drain off as much water as possible from the banana blossom. 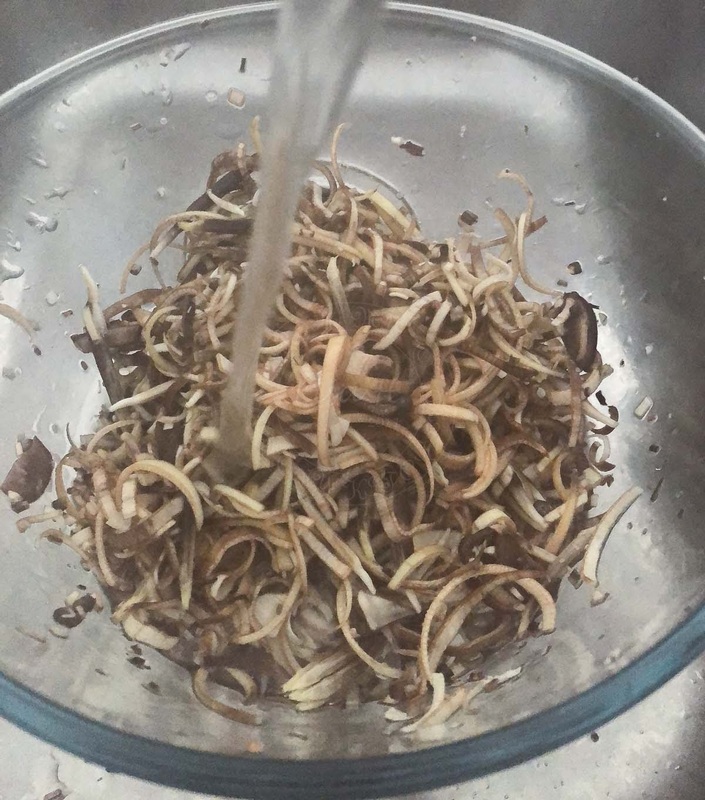 Transfer banana blossom to a mixing bowl. Mix and marinade for 20 minutes. Add beansprouts, chilli, shallots and pineapple chunks. 1) If the blossom is too sappy to your liking, drain off the water and blanch in hot water. Stir and drain off the hot water and immediately transfer to cold iced water. Drain again before adding to marinade. These salad sound Intense and amazing.Thanks for the share!! !